Jenoptik produces spherical and aspherical polymer fresnel lenses as individual items or in small batches using ultra-precision lathes. Polymer fresnel lenses are divided into a set of concentric annular sections. The individual sections are then merged on a plane. These lenses are ideal for optical applications in the fields of lighting, medical, science, machine vision, photography and photovoltaics, for example. The illustration shows the principle, how a large-aperture fresnel lens works. 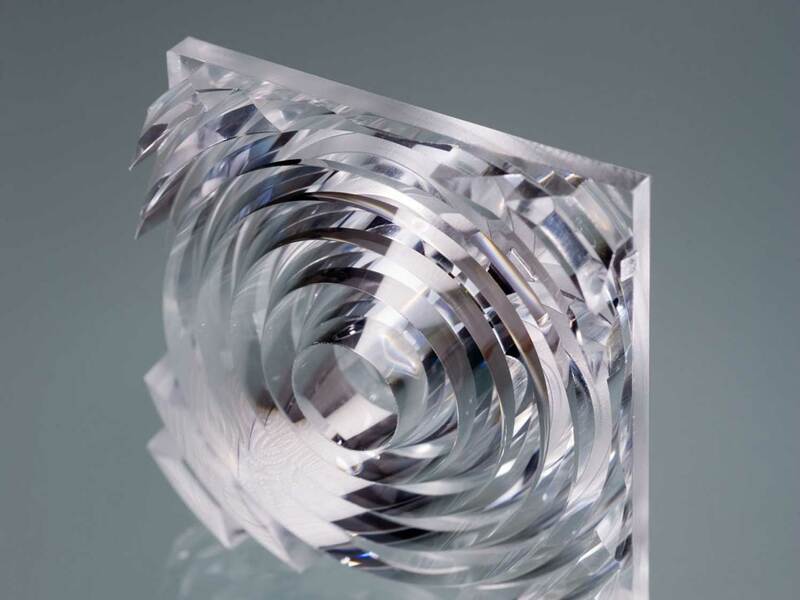 Thanks to ultra-precise processing technologies such as diamond tools and lathes, Jenoptik can realize fresnel structures with very small groove distances as small as 0.05mm. On our special lathes, we produce precise spherical and aspherical fresnel lenses as individual items or in small batches. Convex, concave or even bi-focal structures can be produced, adapted perfectly to your specific requirements. Wie das Prinzip einer hochöffnenden Fresnellinse funktioniert, sehen Sie in der Abbildung.